The Derby City Classic can be a bit daunting for a first-timer. The never-ending action, the unforgiving glare of the ballroom lights, the almost infinite number of distractions � it all adds up to a pool player's paradise. 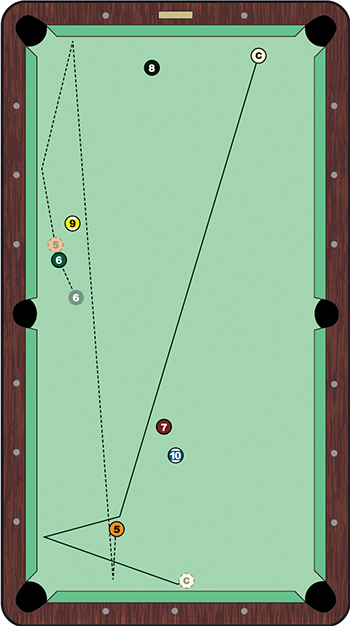 Commentators Mark Wilson and Danny DiLiberto agreed Kazakis only had one solid option: Play a near-stun shot on the 5 ball, sending it up-table and somewhere near the two-ball cluster along the left long rail. Such a shot would require precise speed and control of the 5, which would need to slide just barely to the right of the 9 ball. Kazakis played the shot perfectly. The 5 followed the path shown, coming to rest after dribbling into the 6 ball with a nearly full hit. The cue ball, meanwhile, slid to the left and then came to rest near the middle of the bottom rail. OK, in full disclosure, Pagulayan came to the table and sank the 5 with a rail-first hit and ran out the table. But Kazakis had the last laugh, eventually taking the set, 11-5.